9am - Starting at the Hilton Garden Inn Cajundome (2350 W Congress St. ) Join us for the Teche Ridge Ride - a scenic cruise we put together along the Bayou Teche waterway with stops in Lake Martin, Breaux Bridge, Bayou Teche Brewery in Arnaudville and Grand Coteau to enjoy the local scenery along back roads with some great stops for photos and food & drink before heading back to downtown Lafayette for registration packet pickup and special reserved parking around Parc Sans Souci for the Downtown Alive! show that evening. PARC SANS SOUCI - 201 E. VERMILION ST.
Bayou Round Up attendees can pick up their registration packets in Parc Sans Souci in downtown Lafayette, just look for the big Bayou Round Up banner. Grab your packets with everything you'll need for the show Saturday, and hang out for the big Downtown Alive show onstage at the park! Special reserved parking is available for your vintage rides all around the park - kick off your big weekend right! Curley Taylor and his band, Zydeco Trouble, hail from the heart of Creole country in Louisiana. Curley's soulful, bluesy vocals and the band's hard driving zydeco beat blend to create their unique style of zydeco and blues that keeps audiences dancing. Downtown Alive! is a free concert series held at Parc Sans Souci in downtown Lafayette. SPECIAL AFTERSHOW WITH JIMMIE VAUGHAN & MIKE FLANIGIN TRIO! 10pm - The Pearl (222 Jefferson St, just off of Parc San Souci) After Downtown Alive is done, Hammond B3 organ master Mike Flanigin brings his Jazz Trio with Jimmie Vaughan on guitar for a special show in downtown Lafayette! NOTE: If you leave your cars parked downtown during the aftershow, please move your car to the top floor of the parking garage next to Parc Sans Souci, or make sure you are parked in a legal spot since the street barricades will removed after the Downtown Alive! concert. Kids under 12 are FREE. General Admission parking is FREE. UL Lafayette students just $5 with valid student ID. The car show kicks off at Blackham Coliseum! 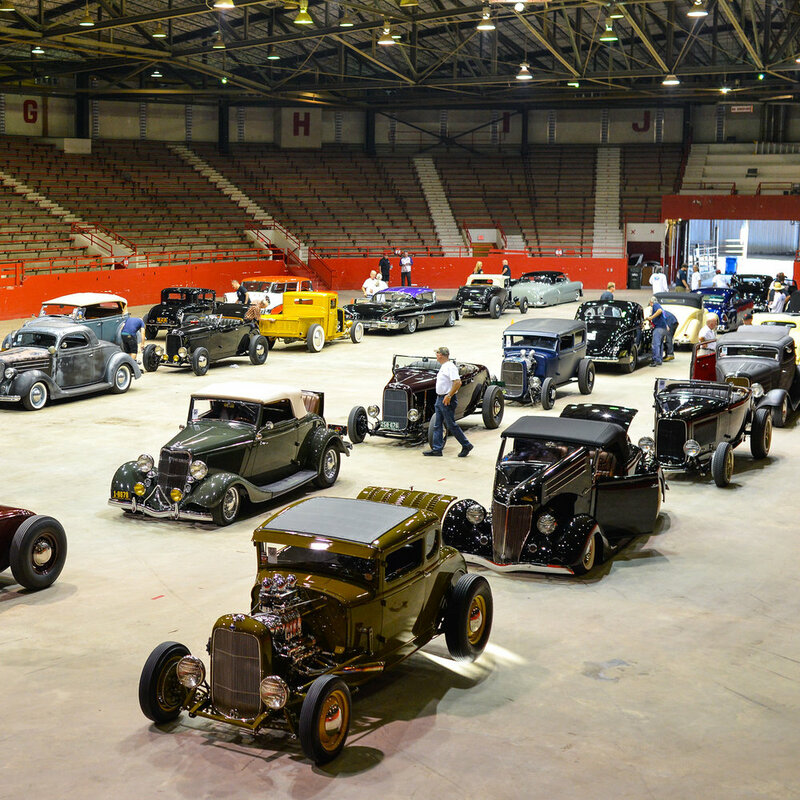 Hundreds of vintage hot rods and custom cars from across the country will be parked all over the coliseum grounds - a select few special feature cars will also be displayed inside on the floor of the coliseum. The Bayou Round Up swap meet begins in the metal barns behind the coliseum and vending areas are open indoors and outside. Great local food and drinks are available and live music will be going onstage all day right in the middle of the action. DJ Matty spinning nuthin' but the bestest Swamp Pop vinyl all day and between acts. Michot's Melody Makers are an electric string band pushing the boundaries of Cajun traditional music. Under the direction of fiddler and Lost Bayou Rambler co-founder Louis Michot, the Melody Makers reinvigorate historic compositions, introduce new melodies, all while evoking soundscapes inspired by Cajun music’s dancehall era, the moment when Cajun music went electric. KC Jones (Kelli Jones) moved to Lafayette in 2006 and quickly became a part of the Acadiana music scene, founding her own trio T’Monde and joining the progressive band Feufollet. It was here in Acadiana that she honed her skills and quickly gained a reputation as a stong and unique singer, songwriter and fiddler, eventually landing her a role in the band of John Paul White (The Civil Wars) with whom she continues to tour off and on today. Her new band "KC Jones” features her own original material with a band of local staple musicians Chris Stafford, Joel Savoy, Trey Boudreaux and Jim Kolacek. Keith Frank "The Zydeco Boss" is one of the leading lights of the "nouveau zydeco" movement. The son of zydeco great Preston Frank - he fuses the traditional sound of his father's generation with latter-day influences ranging from James Brown to Bob Marley to forge his own infectiously danceable style. Hang out after the show as Southern Screen presents a special Drive-In movie presentation of Grease along with a short vintage hot-rod film out on the Blackham Coliseum grounds!. See the map for parking location. Take a cruise starting at 11am at the Hilton Garden Inn Lafayette-Cajundome (2350 W Congress Street) and making its way up a scenic drive up to Pat's Fisherman's Wharf (1008 Henderson Levee Rd. Breaux Bridge, LA) historic dancehall and restaurant on the bayou. Sign up to receive news and updates about the Bayou Round Up.